TATS A KOOL CHALLENGE: Another Wedding! Been thinking about another wedding that is coming up. Isn't it funny how you can go years and years with no weddings then all of a sudden there are 8 weddings all within a few years. This one is our nephew in Essex, England....next one will be our son's....and that will be the end of the fun for a bit. I must admit that I am a sucker for a wedding, I love 'em! Oh and I did buy another outfit for my son's wedding in a totally different colour...this one is in very pale mint green shantung, jacket and twirly skirt and a top patterned with black flowers...calls for an eccentric black fascinator. ....and I actually treated myself to a bought fascinator...just didn't have the inspiration to make another one and this caught my eye, in a sparkly silver. ...it looks really classy but what a pain it was to sew on using invisible thread and a beading needle....I said that I hated sewing!, but it was worth it. It's hard to resist the temptation to put something raspberry coloured into it. Oh my! what it's like to be totally co-ordinated, there never were such times. Did I ever give you a tip on how to keep a fascinator on a comb in short hair? A friend once told me to spray the comb with hair spray which makes it sticky and then put it into my hair. It works a treat and stays in all day. I love wearing them so much that I never take them out until I absolutely have to! 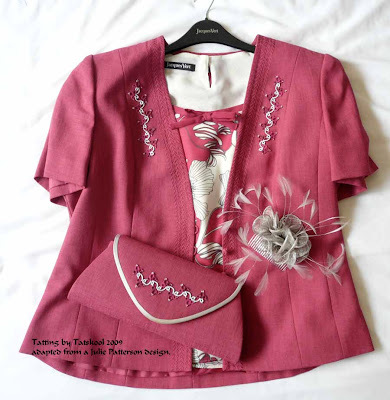 What a beautiful outfit! Be sure to show us pics of you in it! Oh Pamela... You will look Beautiful in this stunning outfit. 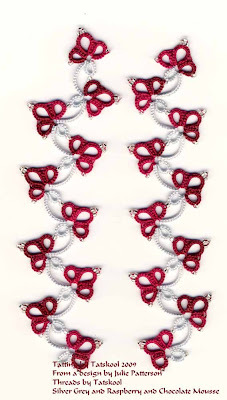 The tatting you chose, the color and the pattern look fantastic with it too!!! 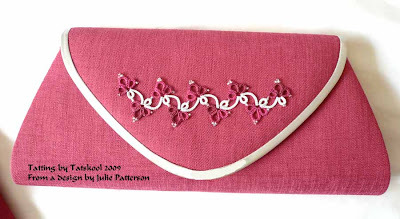 I love the look of the purse too with the tatting trim. You must take a picture of yourself when you have the outfit on. Have fun at the wedding!! I'm curious, never heard of a "fascinator" before. How does one wear such a thing? Love the colours! 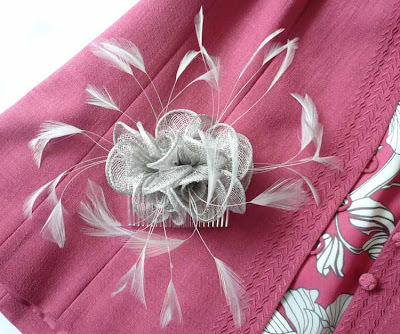 I like the idea of adding a bit of the raspberry to the fascinator. Have fun at the wedding! Hello! I'm back again because I wanted to let you know that I'm having a giveaway! Be sure to come on over and join in! Hi Pamela, I just wanted to pop back in and say hello and see how the wedding went. I'm sure you looked lovely in your outfit. I know the tatted trim looked fantastic on your outfit. Talk to you soon. Hi LadyShuttlemaker,thanks, mmm well I wasn't going to show you a pic but maybe I should change my mind!! Hi Carol,thanks,the tatting trim did look brill I must admit.It's the poshest I have EVER been! 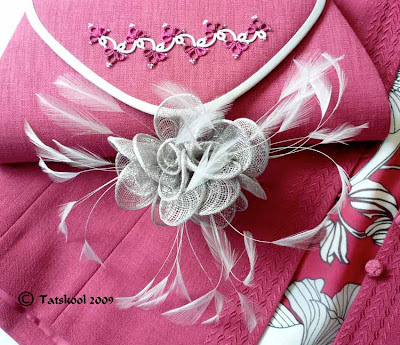 Hi Ladytats, You should definately make a fascinator for your daughters wedding. It was my first attempt for my daughter's Wedding and I was hooked. Hats are OUT for me! Hi Chic, thanks and yes I did finally enter your giveaway....I HAD to! Hi Kristle, you literally just 'stick' it in your hair. Hi Fox, I didn't have time to trim the fascinator, would have looked nice tho with little additions and made it more mine. Hi Carol, I am doing it , I am doing it!! I BugGirl, well you really made my YEAR!! That was the compliment to end all compliments and completely untrue!! I guess we/I so very rarely dress up that it's not often we/I get to make the effort. It was worth the effort to feel good. A little piece of my space!